A New England Life: Why the Llama? I photographed her a few days ago. She's just so darned cute I had to make her the star in my Spring mosaic! *Does anyone know why posts show up with the wrong title in Google Reader? This post is titled Why Llama? but shows up as Why call? Weird! It's almost like a tic tac toe board - White is diagonal and pink the middles - and so nicely done. Really cleaver. I love the llama in the middle. The llama works for me! The colors of spring, I love it! Gorgeous mosaic picture! I hope that you have a wonderful new week! She is very cute and looks great surrounded by flowers. Love the colors pink and white, the centre photos is great. Great mosaic. Isn't she so cute! It looks like she is trying to give us a kiss!! Love the mosaic and the llama! Oh what a wonderful mosaic! I love your Spring beauties...the blossoms and yes. The sweet llama!! Why not feature her! She is perfect! GLORY...what a face. I've never noticed their faces...your pic allowed me a good long stare. Such funny creatures....love this mosaic. Gorgeous collage and cute Llama. You are right, she IS cute and deserves special treatment. :) Love the flowers surrounding her too. Blogger has been doing strange things for more than a week now Sharon. I just hope they get their problems sorted out soon but it does not look as if much is being done about all the problems. The one I am haveing has been outstanding since December. I see now also the count on comments changes and is almost never accurate anymore. I LOVE this mosaic!! 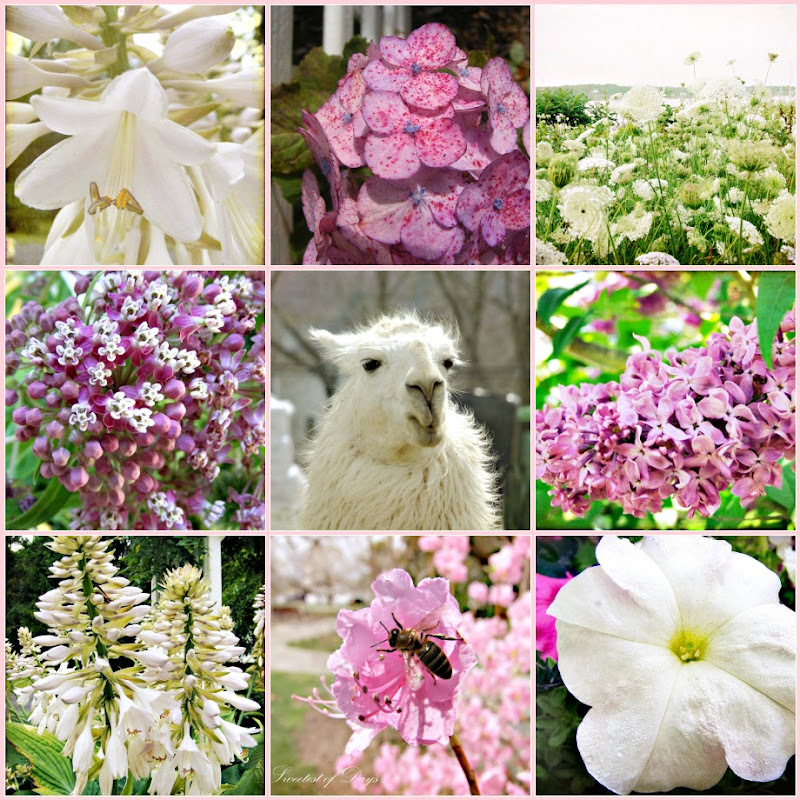 The llama is adorable ~ and the surrounding flowers are just gorgeous!! The llama made me smile! You sure have a lot blooming now! She is so cute, and she looks even cuter surrounded by your beautiful Spring photographs. Never trust Google Reader... it's posessed! Llamas have such sweet faces and he belongs amidst the flowers in your mosaic. I love the mosaic (including the llama)! What nice colors and beautiful flowers! I love this - everything about it. Lovely mosaic! Such pretty flowers! And the llama is adorable too! Well that's all kinds of beautiful! And I love the llama face in amongst the blooms. Google has been weird lately. I love Llamas and think it is only appropriate that this llama should be the star of the mosaic! lovely blooms all! Love your flower pictures, makes me long for nicer weather...it's coming, but I am impatient. And I am sooooo jealous of your pileated woodpecker shots.....and the video!!!! Wow. i agree that she is so sweet!!! Perfect!! I love the llama!! What a beautiful spring collage!! I love llamas. They're so adorable & cute & regal and they give great whiskery kisses. Beautiful collage. You are right ~ she is adorable and looks just right there in the middle of your mosaic! Very pretty all together! I have perused several of your posts and really enjoyed them. Your photograph is gorgeous! So nice stopping by and visiting with you! Sweet place you have here! I don't know anything about the google reader question, sorry. But the mosaic is gorgeous. It's so difficult capturing white flowers but you've done it admirably. Love the pink, too.